One of the great joys I have experienced has been meeting new cachers at "Meet and Greets" as they are touring the world. Absolutely great to socialize with and live vicariously through the adventures of other folks. One of the great aspects of the geocaching game / activity. I hear, reliably, that travelers will NO LONGER be able to host events as they journey about the "game board" !!!!! "PUULLLLLL-EAZZZZZ" educate me on the rationale and decision making process at the "Lilly-Pad". This is a gross oversimplification of the listing guidelines for event caches. Could you provide more details? For example, event caches inside an airport or cruise ship terminal are no longer published. Plenty of event caches hosted by visiting travelers continue to be published. I don't hang out much on social media sites, but the little that I do see there leads me to believe that nothing I read there is "reliable". Cacher attempted to post an event on the historical public dock in CienFuegos, Cuba was denied by reviewer and folks in the "Geocaching Court Of Appeals". As the various GC#'s roll in I will share ... if the folks are willing to share. Sure don't see any caches for several miles, which would lead me to conclude that there is no local Community to attend. Kind of begs the question what a submission of that sort is catering to? I would guess, a smilie and another country. I can kind of understand rejecting something like that, if the only people attending are the folks that ponied up for the cruise. Maybe the OP will offer up more details so that my imagination doesn't run wild. What GC #'s will you be sharing? If an Event Cache doesn't get published, then there will be no GC # to share. 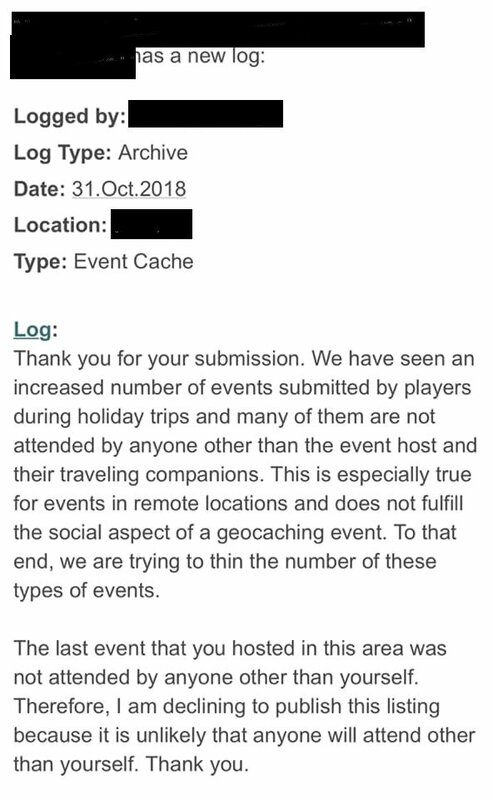 If this is really a case of someone trying to host an Event Cache in conjunction with their geocaching vacation business, then I don't see any problems with the Event Cache submission being denied - even moreso if the Event location was in a place where there isn't much of a local geocaching community. It would be enlightening to hear more about the nature of your reliable source. It could be nice to have an opportunity to find any other geocachers on the cruise ship, especially if you are a lone geocacher. (Travelling alone, or your companion isn't interested.) Then you would have others to cache with, unless they are 'standoffish' bores. But this meet up would need to be in the first port visited to be effective. But yea, I´m also finding it pointless to host an event only fpr yourself. It might always be possible that some people show up, but this cruise ship stops are verry random events. Were you forced to travel alone or was this your choice? There are several thousand travelers with you on this cruise ship to talk to and having fun with. Why not just enjoying the beauty of such a journey? I´d kinda like the idea, that a published event, where only the owner attended will be deleted. Senegal isn’t exactly Geocache-central but there are a small number of local cachers, as well as tourists and business travellers passing through. The event was in a great location held over a few hours in the evening, giving people a reasonable opportunity to attend, but of course it was a long shot. In all honesty, despite me flying my Geocaching flag (actually a t-shirt), this was a family evening out. Should we have logged the ‘finds’? I don't agree. Surely one of the main points of events is to encourage people to get together to discuss caching. If GS refuse to publish caches where they think nobody else will turn up (as seems to be the case) then that becomes a self fulfilling prophecy, people won't go to events because there are no events to go to -> there are no events to go to because people don't go to events -> go round in circles. The argument could be made that it would be permissible for a local to create an event, but not visitors, but I would argue that visitors who are coming from an "eventing culture" hosting events might help encourage locals to get onboard with the idea. Deleting events where only the owner attends will also discourage people from creating events, and again lack of events discourages attendance. I don't see what the big deal is if someone holds an event and nobody turns up, why is it a "problem" that must be "solved", somebody got an icon and added a 1 to their stats - big deal. As long as the event is in a publicly accessible place were anyone could come if they want to (so not inside airport/cruise terminals) then let it happen. BTW I have no horse in this race as I've never held an event, I have attended a few "tourist" events, but those were in Central London so were always going to be well attended and unlikely to have been refused. This is actually a similar scenario to mine: the three cachers were all travelling together anyway. Here they are in Instanbul the week before: GLGXV7PE. And to be honest, if they were hoping to meet other cachers, this was even more of a long shot than mine! Some relatives were travelling abroad, and decided to attend an event. They were the only ones to attend, though the CO logged an atttended, saying he was late. The CO has a lot of events when he travels, and is usually the only one to attend. He frequently posts a very long log describing the history of the place, and frequently posts hundreds of photos. I was travelling with my mother who is mobility limited, so I spent much of the trip with her. I never socialised with anyone else, as I would have left her alone. We did call at five ports and I was able to get off at those alone (except one, where I went on a bus tour with my mother, but that allowed me to find the only available cache ). I went off to walk to caches alone at three ports (8kms at one stop) and a tour on another. It would have been nice to go in company, but had no chance to find company. The best part of the trip was the ports; as sitting around a bar or gambling does not appeal to me. The actual cruise was not so appealing to me, as the ports. Unfortunately the stops in the ports were too short. As a cruise passenger I felt an alien walking around the towns; one of many people doing this. A couple of the ports I had visited years ago as a non cruise passenger, and felt more comfortable then, and that I got more out of it. why is it a "problem" that must be "solved"
Not just another country, but a country in which visitors are not allowed to bring in a GPS. Last I checked there were about 100 caches in Cuba. I have no idea how many geocachers are there though. I know a fair number of Cubans though that would certainly have the expertise (and modern smart phones) to place a few geocaches. I agree with MartyBartfast though. Creating an event at an airport or cruise port hurts no one. Let the creator live with the fact that the only reason they have a find in that country is because they created an event that they could attend. I understand, sorry for my comment. Hi" Mendo Friend" ... the old dog from The Redwoods here. A number of us will be hitting Grand Cayman and Cuba. Motor touring while in port. As in years past we try to have an event which benefit cachers from the visited regions and or another cachers in the area . In the past ... in Argentina, Brazil, Paraguay we have had a great time meeting and interacting with cachers local to the region and of course other international cachers not associated with our particular group who happened to be in the area. At Parque Intervales a couple of years back we had the honor of meeting some Germans, Japanese and Canadians who happened to be in our areas of travel. 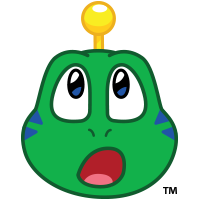 Apparently the new train of thought from "The Lilly Pad" is that some events are solely for the benefit of a particular travel group with the implication that at some level the events rather than being social in nature are somehow asocial. "Da Old Guy" (ME) may be getting a bit addled but the logic seems flawed. Seems like a relatively easy fix. 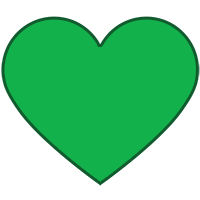 Find one of these, "cachers local to the region", and have them Host the Event. As far as the "Germans, Japanese, and Canadians" comparison, I'm not buying it. All three regions have a relatively active Community, and having an Event tied to their port of call seems like an easy submission to get through the Review process. The other issue, that I demonstrated in my example above, is where the Event Host was not able to make the Event due to delays brought about from the Cruise schedule. I have no problem with HQ questioning people that don't show up for their own Events, and fail to make other arrangements (e.g. reschedule, find a local to take over the Event, etc.). Leaving people hanging like that is just plain rude in my book. Here is a knee-slapper for you Touchstone. A few years ago my caching buddy from Chicago and I from the Redwood Region hosted an event in suburban Denver, Colorado. We, the hosts "posted up" at the wrong restaurant affiliate ... OOOOPPPPSSS red faces. Have a great day "All-Y-All"
Must be a regional thing. The local weekly meet-n-greet has a log book. The two CITO events I went to at the beginning of the year had logs as well. After you attend an event, post an “Attended” log to earn your smiley. To post an "Attended" log on a geocaching event, you must have been at the coordinates of the event during the designated time period. But you’re not required to sign an event logbook. I'm sure niraD knows full well log books aren't required at events. In our area, niraD's and mine, there are always log books at events, nevertheless. That's all he was saying. I have no question port events are catering to people on cruise ships, and I have no problem with that. This thread started because the OP was concerned GS was starting to be worried about what sort port events cater to, but Keystone has assured us that's not the issue, which is a relief. Apparently they've tightened up the requirements so that local geocachers can't be excluded because GZ is inside a restricted area. Well, my understanding is that this has been a requirement for a long time, so I think the point is that it's being more strictly enforced. I understand and respect that decision. I'm not sure I agree with the decision, but I think that's a topic for another day. No one, including the host, could make it to the event for reasons beyond their control. I think it's kinda rude to call that a fail and use it to question their motives. I believe it is regional. Reading logs at night when I can't sleep (got the idea from another in a state next door ;-) shows differences in locations. - Wanna go to sleep quickly, read a couple dozen cache's/event's logs. Here, every once in a while just for giggles I'll say " No, I don't have to sign it", to hear the EO usually say they'll delete my attend if I don't. - Showing them the statement of no requirement to sign, that's been the same since this hobby started, most EOs are dumbfounded. Apparently they've tightened up the requirements so that local geocachers can't be excluded because GZ is inside a restricted area. Well, my understanding is that this has been a requirement for a long time, so I think the point is that it's being more strictly enforced. Consider this refusal to publish an event cache towards the end of last year, which was in a public garden in a large town/city. This had nothing to do with whether locals were excluded - clearly they are not; it's all about "we don't think anyone will come so we're not going to let you hold it" (see my reference to self fulfilling prophecy in my earlier post). And while the area isn't exactly a geocaching hotspot there's a trad within ~0.5 miles, and 6 within ~6 miles placed by 3 different COs so not exactly a caching desert either. I've redacted all the details 'cos it's not my event so don't want to "name & shame" anyone. Agreed. A couple of years ago I noticed that someone has posted an event in Cancun that was to occur during my overnight layover there on the way to Cuba. The day before I left I got a message from the EO indicating that his flight from France was cancelled and he ended up "unpublishing" the event. I found a traditional close to where the event was to be though. Several years ago someone in Ethiopia posted a flash mob event in Addis Ababa. Unfortunately it occurred while I was enroute from Istanbul and apparently nobody else showed up. I know that the same CO has tried to host at least one other event when nobody else showed. If I ever get back to Addis (and there is a decent chance that I will) I would like to host an event just to meet one of the few geocachers living in Ethiopia. I assumed Keystone's answer what quasi-authoratative, but it sounds like he's misinformed. I hope he'll help us figure out what's really going on. While I agree with much of what you've said, I can also see why this particular one was rejected. If nobody showed up the year before, it isn't unreasonable to assume that there's a good chance the same would happen again. It could even be that the reviewer looked and saw no new cachers hiding caches in that area over the preceding year and/or only remote cachers finding the local caches, giving more evidence that there aren't any more cachers in that area than the year before. If this was the first time an event was being attempted there, I bet there'd be a better chance of it being published. Groundspeaks version of a Border Wall?? Tongue in cheek ... put the flame throwers away. I think part of what's going on has come about because of changes Groundspeak has made in the past. Specifically, making stats too important. Let's face it, souvenirs and icons are the bees knees these days and people do all kinds of silly things to get them. I have no doubt Groundspeak realizes that many, if not most, quickie events posted by travelers are put out for one of the above reasons. But presumably, in this case, the cacher got their new country / icon / souvenir for their ‘non-event’ the previous year. Why hold another? Maybe a genuine hope (if not expectation) to meet other cachers? I struggle to see the logic in refusing this one. I agree, this wasn't the reason Groundspeak decided against that one event. Groundspeak's reason is obvious but what's not obvious to us is how Groundspeak knows ahead of time that no one else will show up. Events used to be special times for people to come together and socialize. They lasted more than 15 minutes and people had a great time talking geocaching. But it wasn't long before people began stacking them so guidelines were put in place to cut down on some of that tom foolery. 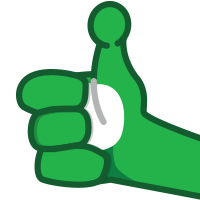 Now we're seeing some/many events being submitted primarily for souvenirs and icons. I don't think anyone should be all that surprised to see new guidelines come along to address this situation. Nothing I've posted to this thread is inconsistent with the public listing guidelines and help center articles, including this one, nor with the private written guidance provided by Geocaching HQ to Community Volunteer Reviewers. So, no, I'm quite well informed, thank you. I certainly didn't mean to imply you don't know the guidelines forwards and backwards. Your initial response was to declare to the OP conjecture about why the event he mention was rejected were a gross exaggeration of the guidelines, as if the guidelines would be the only reason the event the OP was talking about could possibly be rejected. But then, unless the rejection message was fabricated, an event was, in fact, rejected for exactly the reasons the OP speculated about, gross exaggeration of the guidelines or not. I'm sorry my wording upset you, but I think it's still reasonable to interpret your original response being that something couldn't happen, yet we later saw evidence that it did, in fact, happen. We all understand the this rejection wasn't according to the guidelines, I just though you might be in a position to tell us what it was based on. I certainly didn't mean to imply you don't know the guidelines forwards and backwards. Your initial response was to declare to the OP conjecture about why the event he mention was rejected were a gross exaggeration of the guidelines, as if the guidelines would be the only reason the event the OP was talking about could possibly be rejected. But then, unless the rejection message was fabricated, an event was, in fact, rejected for exactly the reasons the OP speculated about, gross exaggeration of the guidelines or not. I'm sorry my wording upset you, but I think it's still reasonable to interpret your original response being that something couldn't happen, yet we later saw evidence that it did, in fact, happen. We﻿ all understand the this rejection wasn't according to the guidelines﻿, I just though you might be in a position to tell us what it was based on. I don't see the confusion here. The OP said he was informed that "travelers will NO LONGER be able to host events". Keystone replied this was an oversimplification - i.e. travellers can still hold events, but there are restrictions (see above). It turns out that the event was planned for a port area in Cuba. Speculation, but this could have been refused for either of the above reasons (or both). MartyB then brought up the case of a second refusal, which seems to have fallen foul of the first restriction. We don't know where the event was to be held, so it's impossible to speculate on likely attendance, but the turnout at a previous (non-)event has clearly counted against the cacher. From the available information, I'm ok with the first decision, but less so the second. Either way the reasons do seem to be covered by the guidelines. Every ocean-going cruise I've been on had a 'bulletin board' that could be used for organizing unofficial events of this sort. In some cases, you'll need to wave them by the front desk for approval. For river cruises, it can also be done this way, though in these smaller groups, you can ask that it be announced by the Cruise Director on the first evening out of port. As long as the event is in a publicly accessible place were anyone could come if they want to (so not inside airport/cruise terminals) then let it happen.
" Events cannot be held in or near transportation centers "
"Near" is of course subjective, but when I commented about a St. Lucia event in the other 'vacation cache' thread (just down the list a bit) about events held 'near' such locations, the event in port current at that time was to be held within 100' of the gangway of a cruise ship -- which did seem to me to qualify as 'near'. I was using St. Lucia as a general example of a number of vacation cache issues, and that event just happened to 'fit'. In St. Lucia, there are more event caches scheduled per year than there are other cache types in total. Yes, the word "near" had me puzzled too, particularly in reference to railway stations which are singled out in the guidelines as one of the things an event can't be "near". I queried this in the local reviewers' FB group when it came up for discussion and their interpretation was that anywhere outside the ticketed area of the station would be fine. The example that came to mind where "near" could be problematic is Sydney's Circular Quay, which has an elevated railway station above it, a major ferry terminal and alongside that an international cruise ship terminal. Soon it will also have a light rail interchange to add to its mix of transport hubs. Yet the Quay's grassed areas and eateries make it a popular place for events, particularly those hosted by visiting cachers, and being near the transport hub makes it easy for the locals to attend as parking in central Sydney is an expensive nightmare. Groundspeak's reason is obvious but what's not obvious to us is how Groundspeak knows ahead of time that no one else will show up. "They aren't in Kansas anymore". The wizard has omnipotency is my best guess. As far as the "Germans, Japanese, and Canadians" comparison, I'm not buying it. All three regions have a relatively active Community, and having an Event tied to their port of call seems like an easy submission to get through the Review process. I think you misread the reference to Germans, Japanese, and Canadians. The quote was saying that they met Germans, Japanese, and Canadian cachers when there were in Brazil a couple years prior - not that they had events in Germany, Japan, or Canada. In the past ... in Argentina, Brazil, Paraguay we have had a great time meeting and interacting with cachers local to the region and of course other international cachers not associated with our particular group who happened to be in the area. At Parque Intervales﻿ a couple of years back we had the honor of meeting some Germans, Japanese and Canadians who happened to be in our areas of travel. I'm not quite getting the whole idea of not being able to host events at multiple ports of call on a Cruise vacation. If the idea of an event is to meet new cachers then why not host one and hopefully draw in some local cachers? I get the fact that in some cases the only attendee could be the host, that's the chance you take, or if that was the intent then that's on the host for pulling that one off. It's certainly isn't my intent. I would have liked to meet a local cacher or 2 and possibly get a few tips on the caches that I would like to seek out while visiting for the day. I for one would have like the opportunity to meet other cacher but sadly I was only permitted to host one event for the trip so i had to make a choice. Afterwards I did a bit of looking around and it seems that a couple of cachers found a work around for this rule. They took turns hosting events in different ports of call. A little sneaky but not against the rules. Since I am the only cacher in our couple, I can't readily pull that one off. So hopefully there are other cachers on the same cruise ship that will host an event in another one of the ports....fingers crossed. If you intent is to meet some local cachers at these ports of call, the obvious solution is to contact them and see if they'd be willing to Host an Event when you are in the area. If they don't, then it sounds like the Reviewers impression of the Events was correct in the first place.